In their newest preview for 3.13.0, Blizzard reveals their newest mission for Starcraft 2 coop mode, which is based on the Legacy of the Void mission “The Host“. In our newest Co-op Mission, Lyrak, one of Matriach Vorazun’s scouts, reports the discovery of a new threat from Amon. Lyrak discovers that Amon has created a new type of Hybrid and is beginning to awaken it by funneling energy from a Xel’Naga temple. Your mission is to prevent Amon’s most powerful weapon from being unleashed on the universe. Scattered throughout the map are Void Slivers that are channeling energy to spawn the Voidshade Hybrid. They are protected by Void Rifts that will spawn enemies from every race. If players do not destroy a Sliver within the time given, the Hybrid will be summoned and you will instantly fail the mission. You’ll need to constantly monitor the remaining time and decide when is the best moment to send your army on the offensive. Because of the threat that this new enemy brings, your secondary mission is to help evacuate the citizens in the surrounding city and save them from Amon’s attacks. To do so, you have to clear a patch for the shuttle and ensure that it arrives at its destination safely. Scythe of Amon arrives with Patch 3.13.0. Which commanders do you think will do exceptionally well on this map? Let us know in the comments. We’ll see you on the battlefield! Everything has a beginning, and so does the original Starcraft. In preparation of Starcraft: Remastered, Blizzard takes a look back at the chaotic creation of their beloved game in their latest update. The classic is back! Blizzard announced Starcraft: Remastered, a 4K Ultra High Definition remake of the original game. This is a return of the gameplay of the beloved game from 1998 but with a fresh coat of paint using updated graphics and audio, as well as added matchmaking, ladder, social features and more. 4K Ultra HD Graphics and Upgraded Audio: StarCraft: Remastered will include high-resolution unit models, buildings, doodads, and tilesets, as well as high-fidelity music and sound effects to bring the original game into the modern era, while retaining the classic StarCraft style. Same Timeless Gameplay: The gameplay balance and idiosyncrasies have been painstakingly preserved from the original game. Mutalisk stacking, magic-boxing, unit pathfinding, control-group limitations, and more will all remain intact, allowing veteran players to enjoy playing and watching high-level competitive matches as before. Includes Original and Expansion Campaigns: Return to the planetary battlefields of the war-torn Koprulu Sector and command the forces of the terran, zerg, and protoss across more than 50 story-driven single-player missions. Fall in Love Again: Relive the epic saga of some of gaming’s most memorable and beloved heroes and villains, including Marshal Jim Raynor, Lieutenant Sarah Kerrigan, and Praetor Fenix. Enhanced Storytelling: Original cinematics will be improved to 1080p resolution, while mission interludes and introductions will feature new comic-book style illustrations. Blizzard’s Gaming Network Brings a Bevy of Features: In addition to accurate matchmaking and enhanced ladder functionality, players will also be able to stay in touch with and chat with friends playing other Blizzard games. The classic functionality of named custom games and custom game lobbies will be retained, for the familiarity of long-time StarCraft players. 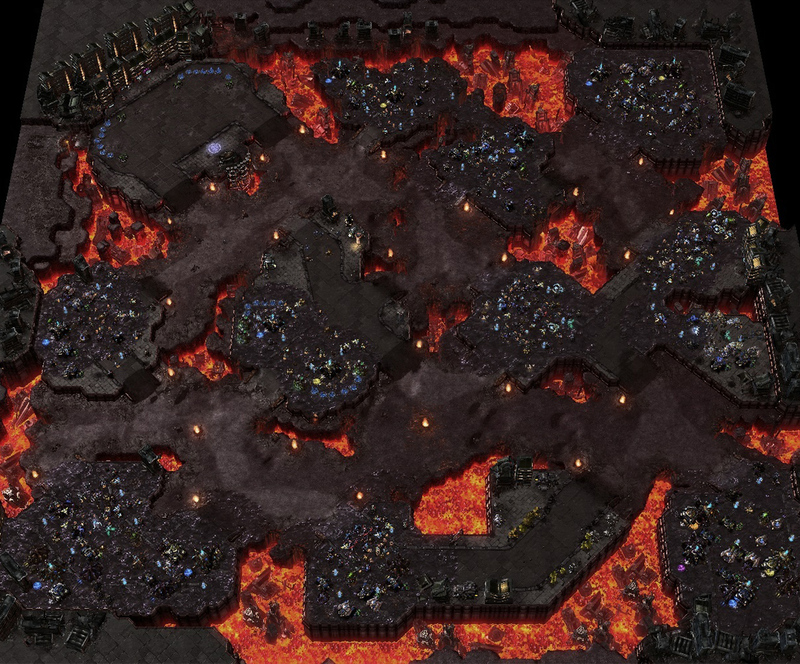 The UNN news anchor Donny Vermillion returns, and with him comes a new map for Starcraft Coop. Based on the Wings of Liberty mission “The Devil’s Playground”, this mission sends you on the planet Viridium Prime to harvest so called “xenon crystals” before the planet explodes. Just like on Redstone III, lava will rise on a regular basis, forcing you to bring your ground forces to safety before the lava incinerates your units, and in turn disrubting your harvest of xenon crystals. Like with other coop missions, there is a bonus objective: In “The Vermillion Problem” you have to defeat a lava monster, which only appears when the lava level is high. Visit the original article here to read in detail what Adam Levy, gamedesigner at Blizzard, can tell about the creation of this new coop map. Blizzard revealed today the coming features of the next Patch for Starcraft Legacy of the Void. 3.3 will introduce two things: Mutators and Mastery Levels. Spice up your games with the weekly mutator challenges, including but not limited to sleeping workers, invisible armies, tornados, fast enemies and infested zombies assaulting your base. To make these challanges worth playing, playing commanders beyond level 15 will contribute to the mastery levels, which will give you points to spend to strengthen your units and abilities across commanders. Finally, there is one small unmentioned reveal: the next commander to join the battle is Abathur, the evolution master mind behind the swarm. Nova will have access to various loadouts like different weapons, goggles, etc.